The University of Michigan is a very big school with a very big list of outstanding athletes and staff. And they had a very big challenge for Perfect Prototype and our partner Dimensional Innovations: create a visual experience that is both massive and personal. That meant blending the innovative technologies of Kinect gaming and augmented reality with other clever interactives and traditional electronics. What resulted were two gigantic video walls for Kinect gaming and four Kids Zone interactive exhibits — results that were so impressive that we were asked to add a new motion-sensing football game, and to consider more games in the future. Two massive multi-touch video walls, each with 15 monitors. When not in use, each wall becomes one large video screen. 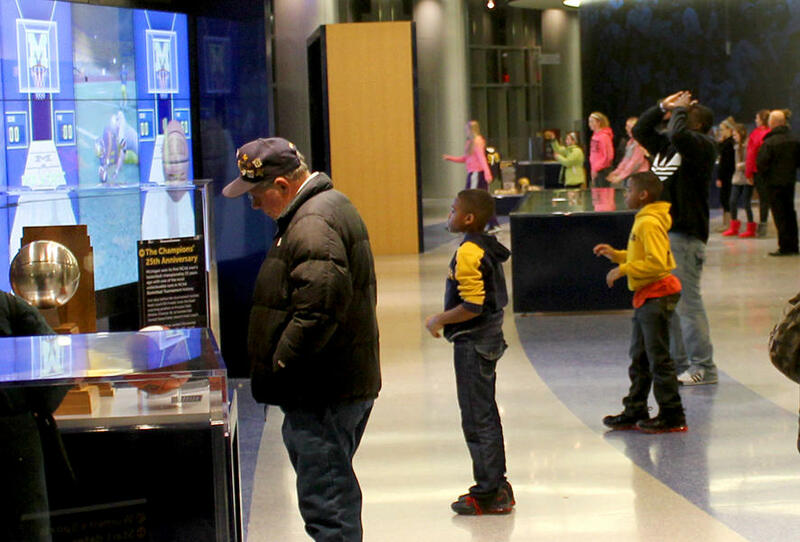 But, when visitors want to interact, the walls turn into play stations, information monitors, and screens for watching videos of Michigan sports moments. Each of the 10 monitor columns – 5 on each wall – has it’s own Microsoft X-Box Kinect motion sensor that let fans try their hand at a custom basketball shooting game, and our new football game. And behind all of that equipment is a comprehensive content management data system loaded with a directory of staff and all-time greats, highlight videos, and complete lists of Michigan’s donors. Shoot some baskets – Kinect Style! Perfect Prototype’s custom Pop-A-Shot game uses a Microsoft X-Box Kinect motion sensor to track players’ bodies and let them shoot baskets with just their arm motion. Our newest and most ambitious Kinect game, the Michigan Quarterback Challenge gives you 90 seconds to engineer a game-winning drive and beat – uh, Ohio State! Again using the Microsoft X-Box Kinect motion sensor, we track a player’s body to detect when he or she is throwing the ball. Better look for an open receiver because rotating the body also rotates the view of the game, and the receivers are open only for a short time. Perfect Prototype created the complete turnkey solution. Learn more about this motion-tracking game by clicking here. This attention-grabbing kiosk combines advanced technology and fun. Face-recognition and HD cameras capture the fan on screen and trigger the augmented reality engine to superimpose the 3D “game face” selected by the user. Fans can enter their email addresses to have their images instantly emailed to them. Perfect Prototype also created a jump-height interactive and a more traditional POP-A-SHOT electronic basketball game for the Kids Zone.